Fun Wheels Pink 6V Battery Operated Motorbike. 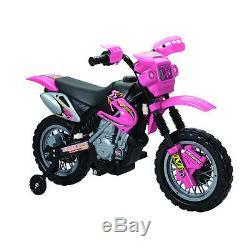 Product Description: 6-volt Battery Operated Motorbike in Pink. Full left and right steering with forward drive. Working front light, horn, and on/off power switch. Press button on the handlebar to go. Ages 3 to 8 years old. 55-pound weight limit with speeds up to 2 MPH. Good for a 1 or 2 years old not for a 5 year old. Very cute, Granddaughter just loves it, great for 5 year old. My grandchild is really enjoying her motorbike. Great bike for a 5 year old. It has training wheels and is very sturdy and easy to operate. We got this for my daughter for her 2nd birthday and she loves it! Our award-winning customer service agents are available 7 days a week. Customers cannot specify the carrier of their choice. Items marked as FINAL SALE are not returnable unless the problem you experience is the result of our error. The item "Fun Wheels Pink 6V Battery Operated Motorbike" is in sale since Thursday, December 31, 2015. This item is in the category "Toys & Hobbies\Outdoor Toys & Structures\Ride-Ons & Tricycles\1970-Now". The seller is "overstock" and is located in Salt Lake City, UT.